In today’s society, we are all pushed for time. I get it. Time is precious and hard to come by. Everyone has the same 24 hours within a day, but what we choose to do with most of our time is up to us. Usually, our day requires great time management where unforeseen circumstances can throw us off of our schedule. This can make for a bad day or a blessing in disguise. It all depends upon how you choose to look at it. Today, I had to stop at one of the dollar stores to pick up a few items. I was hurrying through the store as usual because I had a laundry list of things to do. As I was checking out, I saw a woman who appeared to be legally blind, disheveled, and out of sorts. People were staring at her in disdain because of her appearance and somewhat outburst as she interrupted the cashier checking me out and asked her who the manager was several times. After the cashier finally responded and the manager appeared, she asked where a certain item was in the store and if he could help her find it and other items. He told her that he could not shop for her and rudely walked away. She said thank you and appeared to be defeated. As I was walking out of the door, something had spilled in my bag and made me go back into the store because the items had to be replaced. As I was heading to the back of the store, the same woman appeared walking down each aisle searching for her items asking people to help her, but she was being ignored I’m sure due to her appearance. She finally stopped to ask me for help. Keep in mind, I was in a hurry and pressed for time. I was already upset that I had to go back into the store due to the spill in my bag. Now, this lady was asking me for help and wasting more of my time. In the back of my mind, I asked myself why am I the one always caught up in situations like this. For some reason, people are just drawn to me. As I was standing there, my spirit immediately convicted me for having such negative thoughts about someone interrupting my day. She was a woman in need and displaying an act of kindness wouldn’t cost me anything. So, I decided to help her find what she was looking for and other items within the store. She immediately thanked me for helping her, then I proceeded to find my items I needed to replace. Once she got to the register to checkout, I asked her if she had enough money to cover her bill. If not, I was going to pay the difference. She said that she did and thanked me again. I followed her out of the store to make sure she had a ride and wasn’t walking anywhere in the cold. She got into the passenger seat of a car. Now, why the person who was driving didn’t go in to help her shop is beyond me, but that wasn’t for me to understand nor was it the lesson for me to learn. Here are 10 key points I learned from today. •Kindness is a matter of choice. Not a matter of time. •Displaying acts of kindness doesn’t cost a thing. •Do not be quick to judge others based upon their appearance for you do not know their plight. •Interruptions aren’t always hindrances of time. Sometimes they are pockets full of grace that brings joy and gladness to others as well as to self. •You never know when you might be in need therefore be humble and grateful in all things and don’t be in such a hurry where you can’t lend a helping hand. •There’s nothing more powerful than the human touch for it leaves footprints upon the heart and it warms the spirit. •Don’t worry about what others are not doing. Do what you know is right. •Lessons learned are not always about you. Sometimes, it’s to bless others or show them their flaws, shortcomings, or need for improvement. •Time, opportunities, and people expire. It’s important to value all three before it’s too late. •Showing acts of kindness can spark a movement for others to do the same. Be that spark. I will probably never see that woman again in my lifetime, but she left an impression on my heart that time can sometimes wait…but the necessity of the human touch and acts of kindness can not. I hope I left an impression upon hers. Previous postLove is a Choice: I Choose Me. Next postThe Race is Not Given to the Swift nor to the Strong, but to the One Who Endures to the End. That’s walking out your faith Almetria! I wonder how many of the others who passed her by were Christians who failed to make the God-honoring choice you did. 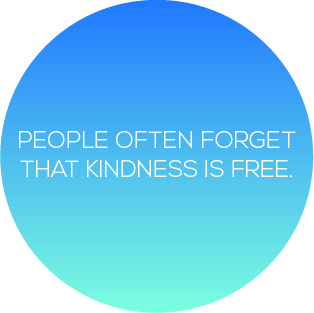 Thanks for the reminder that extending kindness to one another, is simply a matter of choice. Thanks LaMonica. We are blessed to be a blessing. You never know when you are entertaining angels.